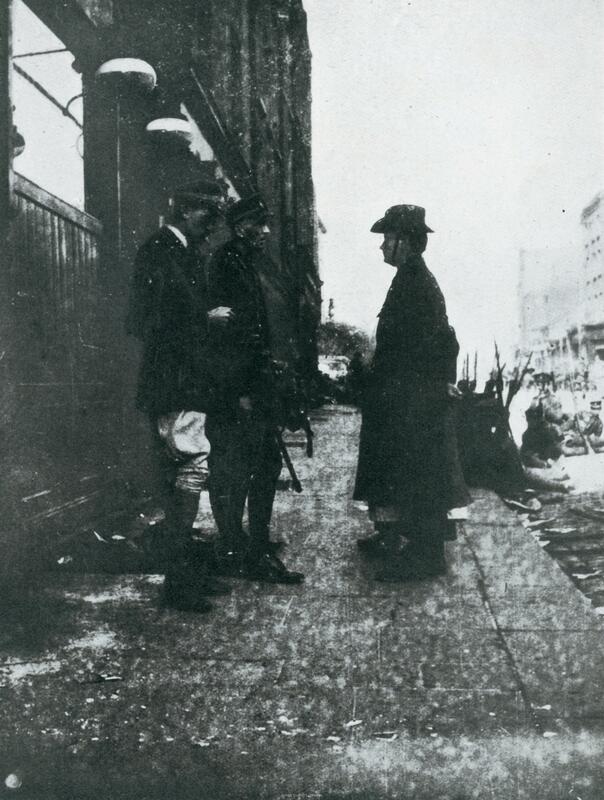 The Insurrection’s last stand, and site of the Republican Army’s surrender took place on Moore St. After evacuating the G.P.O. the rebel’s plans were to head towards the Four Courts, via Moore St and Parnell St. Yet as the Irish troops entered the Moore St district they immediately came under heavy fire. One of the founding figures of the Irish Volunteers, Michael O’Rahilly, led a sortie of men towards the area and was fatally wounded. The intense fighting claimed a number of civilian casualties including Dubliners who were either shot by Volunteers, fired upon by British soldiers, or simply caught up in the crossfire of open street warfare. The highest number of casualties during the Rising were non-combatants, and of the 590 people killed during the Rebellion, 374 were civilians, including 38 children. The Volunteers eventually found refuge in the tenement houses on Moore St, with the final Republican headquarters located above Hanlon’s Fish Shop. At 3:30pm on Saturday 29th April General Lowe, met Patrick Pearse at the top of Moore St, who duly offered his unconditional surrender to the British Forces.